The Whisperer in Darkness was a film I just had to see. After having seen The Call of Cthulhu, which was a short, silent version of a Lovecraft classic, I knew I’d want to see anything this company (known as the H.P. Lovecraft Historical Society) did. In their newest film, and first feature, they tackle The Whisperer in Darkness and shifted from a silent film representation to a monster film of the 1930s approach. In both cases, the style of film that is emulated perfectly suits the work being interpreted. I firmly believe this to be the case, regardless of your familiarity with either of these very distinct niches. If you are unfamiliar with Lovecraft this is a great introduction as it very faithfully, but also intriguingly in cinematic terms, renders the narrative. Any admirer of film, regardless of what era(s) they prefer, will recognize some of the conventions on display in this film, and as details of the narrative unfold it’ll become clear the choice is an inspired one. Much of this is a roundabout way of saying that odds are you’ll like this if you go in with the knowledge of what the film is attempting, and you could be a fan of either or neither end of the narrative equation and walk away liking it. However, if you like both it’s rather heavenly, or should I say hellacious? Either way, it’s great stuff. The life of a horror sequel is not an easy one. Invariably, whether from the fandom that spawned the sequel or the critical masses, a continuation will be far more scrutinized it seems. Not to worry, Dear Reader, I am not opening up the Pandora’s Box that is editorializing on the agglomeration of reviews, or even fan reaction. I’m pointing out that while I was anticipating this film highly, I too went in ready to be overhyped and possibly disappointed, as the original was one of the tops of 2012, but I must say I walked away most certainly pleased. One of the biggest successes it that it is indeed an expansion of the mythos, a further closer look rather than a straight-up regurgitation that many series seem to covet, and at times audiences seem to demand. A classic example would be how Carpenter originally had designs on the Halloween series always telling different tales on All Hallows’ Eve, yet he only managed to steer the films away from Michael Myers once. 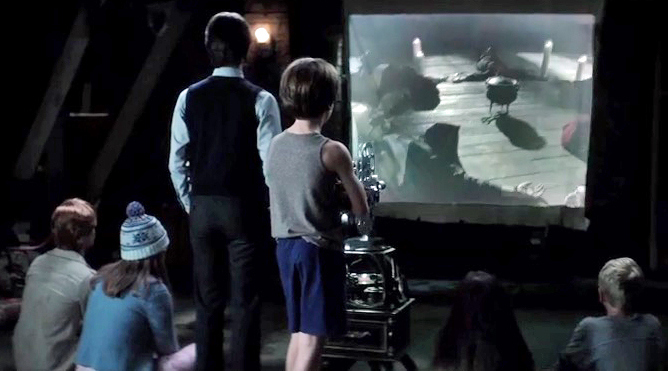 Sinister 2, follows-up and picks up with Ex-Deputy So & So (James Ransone) from the first installment. He’s back but having found no satisfactory resolution in his own mind he continues to seek out properties where similar occurrences happened that can be linked to the demon Bughuul. Almost immediately the film puts you in a new frame of mind, ready for anything, as it seems to be playing a temporal trick. By casting one of the boys (Robert Daniel Sloan) and making him look a lot like a young Ransone; and having few telltale signs of era you wonder for a bit if these sequences aren’t flashbacks to his past. This is quickly cleared up and cleverly played into. With this trick played, and explained away ,you’re prepared to tread a different path. Another differentiating factor is the interweaving a naturally fearful situations: namely the custody dispute and domestic violence themes displayed by the contentious relationship that Courtney (Shannyn Sossamon) and Clint (Lea Coco) enact. Coco is chillingly convincing as a sociopathic, abusive, ex-husband. This just adds a layer to the terror, which is natural rather than supernatural. Further layering this tale is the shift in perspective from that of a terrified father (Ethan Hawke) learning of this strange, dark past through these home movies; to the children targeted to be sacrificed to and to make offerings to Bughuul. What is brilliantly left behind the curtain in the original is revealed here, and examined with results that are nearly as terrifying, and just as captivating. The children herein also play well on a classic horror trope: that of twins. This film differentiates itself first by making them fraternal, and secondly by having these two have entirely distinctive personalities. This is also intimated early on by one subtle fact: they do not share a room. Just having mom have separate bedtime visits in different rooms and talk to each about the other makes an immediate statement. Having the children be more the focus means they have to a little more this time around than just look the part of scary ghost or unfortunate victim. Starting with the twins played by Robert Daniel and Dartanian Sloan they are expertly cast and play their types to a tee. When necessary they emote precisely namely Robert Daniel engendering sympathy and pity, exuding fear; Dartanian on the other hand inhabits the role of bully and can strike fear, and causes shock in the blink of an eye. Those children who are apparitions are also allowed to have their moments namely Lucas Jade Zumann as Milo who delivers the most hypnotically serpentine performance by a young actor since Frank Dillane in Harry Potter and the Half-Blood Prince. Delving further in to the plot there are great single-scene subplots like the Norwegian Hell-Call, which I wouldn’t mind seeing a whole spinoff film about, and also the clever excision of Vincent D’Onofrio’s character. Granted it was likely due to scheduling more than anything else, but it works and leaves the door open for a return if needed. Coincidentally, I saw Sinister 2 with the same large group of friends as I saw the first one, and it similarly caused quite a bit of discussion afterwards. When more often than not the reaction after a horror film is tepid apathy, or worse disgust (I’ll never forget the reaction at my screening to The Devil Inside); this is least one can ask for but it goes further than that.